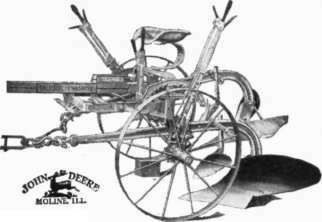 A fine plow for potato growers and truck farmers. It turns all the soil one way, leaving no dead furrows or back-furrow ridges. In irregular fields it leaves no crooked dead furrows - and all furrows are straight. When used in arid climates, harrowing and planting can be kept up with the plowing. In this way evaporation is checked and seed is planted in moist soil. No tools equal a good disk for finely pulverizing the soil. One or two diskings make a nice, deep, mellow seed bed for potatoes. Spring pressure enables this harrow to penetrate and cultivate an even depth the full width of cut. Third lever controls spring, hence operator can set the disks for thorough work in all conditions. Either solid or cutaway disk blades may be had. Double disking saves one half in time and labor, and secures better results than two single diskings, because the soil, freshly broken by the first selection, is pulverized by the second section without giving any opportunity for drying out and hardening. Front section is out-throw, rear, in-throw, leaving the land surface level. Furnished with both solid and cutaway disks. This machine is especially good for cultivating potatoes, because it will work in wide or narrow rows and rigs can be spaced to suit lean or bushy rows. 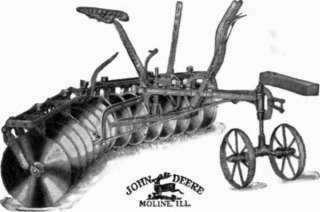 Wheels are shifted by foot pedals which make it easy to guide cultivator and dodge plants out of line with row. 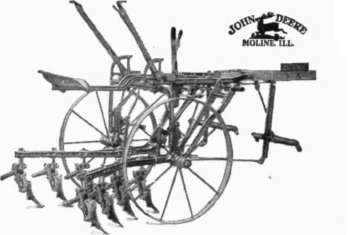 Spring tooth rigs, disk or moldboard hillers can be used on a John Deere KA cultivator. It is equipped with spring trip or pin break rigs. Longer, narrow shovels are also used on this cultivator in some districts in the West where extra deep cultivation is required. The Deere potato digger has been in successful use for many years, and is equal to any requirement that may be made on it. It works with very light draft and throws the potatoes out of the ground without cutting, leaving the ground in good shape. The gauge wheel regulates the depth and helps to steady the digger. 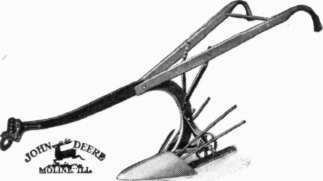 An ideal implement for the man who grows a limited area of potatoes. Sprocket, which runs on ground, gives hinged grating and up-and-down motion. This shakes out the dirt and leaves the tubers in a clean, compact row. Weed fender clears away weeds and vines ahead of blade. This digger is inexpensive and can be owned by any one. A wing shovel and extra bars to widen grate are furnished for sandy soils.